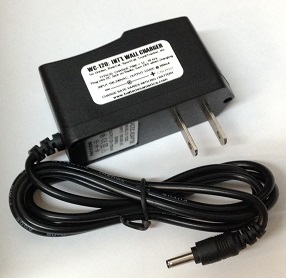 Home > Chargers > Wall Chargers > WC-120: Wall Charger for Uniden, BearCat, SportCat, TrunkTracker radios etc. WC-120: Wall Charger for Uniden, SportCat, BearCat, TrunkTracker handheld scanners. Input 100-240VAC (worldwide use; output is 12v 200mA. Plugs into radio to charge 4.8v batteries (BP-120, BP-180, BP-250, BP-120s, BP-120x, BP-120xh, BP-120xx,BP-120exx, etc.). Plug size 3.5mm outside x 1.35mm inside, center hole polarity Positive (+). Charging time varies with radio and battery capacity; the charging time range is 12 hours (for 700mAh batteries) to 24+ hours (for 2000mAh+ batteries).